Add some instant glow to dull, tired and lifeless skin with VLCC Insta Glow Oxygen Bleach. It stimulates bodyA s natural healing system and collagen production, and has anti-inflammatory and antibacterial properties. It can also help skin glow with life and vitality. VLCC has formulated this unique plant-based bleaching formula which when applied on the skin, releases oxygen which lightens skin tone, purifies the skin from within, stimulates it and leaves it looking radiant, fairer and refreshed in just 15 minutes. 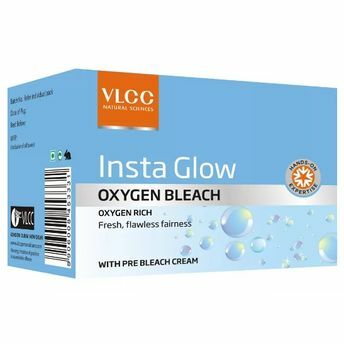 Additional Information: With the motto of AAlternatively, you can also find many more products from the VLCC Insta Glow Oxygen Bleach range.